AFTER four decades of relying on the profit motive to ensure buses are run efficiently and, in turn, keep public spending in check, Singapore has admitted that a model change is due. The Government will now implement a contracting model, where operators bid for the right to operate routes in a competitive tendering system. Tenders will be awarded based on, among other things, the competitiveness of a bid and the track record of the bidder. Having secured a contract, operators will be released from the tension of having to balance revenue and service standards - something which they have been trying to do in the last 40 years or so. They will also be freed from having to acquire and hold on to operating assets which translate into hefty depreciation charges on their profit-and- loss accounts. The Government will own all infrastructural and operating assets. Operators will thus be able to focus on meeting service standards, which the regulator - in this case, the Land Transport Authority (LTA) - monitors periodically. Those who meet or exceed standards will be rewarded with bonuses. Those who fall short forgo bonuses and, in severe cases, risk not being able to take part in future contracts. Such a system has proven to be successful in several cities, including London, Sydney and Copenhagen. The question is, how well will it work in Singapore? In principle, it is a superior system. For one thing, it facilitates price discovery, where the true cost of providing a service is arrived at via competition. For another, it allows government subsidies to be disbursed more elegantly. The billion-dollar Bus Service Enhancement Programme - where the Government pays for a fleet of buses and their running cost for 10 years - for instance, has been criticised as an indirect subsidy for the operators. It is, in fact, a subsidy for commuters. In a contracting regime, there will be less ambiguity. Moving to the contracting model will also mean that Singapore will at last harmonise the way it finances its buses and trains. Up till now, the rail system has received more support, ostensibly because of its huge capital outlay. Most importantly, a contracting regime will allow the Government to have more say and control over service standards, simply because the state will now pay the operators for their services. And because it is paying, the state now has a more direct interest in getting desired outcomes. Previously, it was difficult for the Government to push for higher standards in the face of declining bus profits and, in some instances, outright losses. That was why it had to roll out the Bus Service Enhancement Programme. So, contracting is a better system. But it may not be a more cost-efficient one, as similar systems have demonstrated. In London, bus subsidies grew from £41 million (S$86.5 million) - 6.5 per cent of the cost of contracts awarded - in 1999/2000 to £653 million (40 per cent of the contracts' cost) in 2007/2008. According to a study done by KPMG, the reason for this was that costs rose faster than fare revenue, which the government collects and keeps. In Singapore, The Straits Times understands that City Direct services, which conform to the contracting model, have been running with hefty subsidies. According to insiders, the LTA has been able to recover only 50 per cent to 60 per cent of the contract cost through fare collection. The simple solution would be to increase fares. But the pressure to keep fares affordable will remain in the new model. In fact, the pressure may be greater. In London, for instance, bus fares in real terms have been sliding steadily since the contracting system was adopted in the mid-1980s. And even though Transport for London (the LTA equivalent) has the mandate to increase fares annually via a fixed inflation-plus formula, adjustments are not always carried out to the letter, according to KPMG. 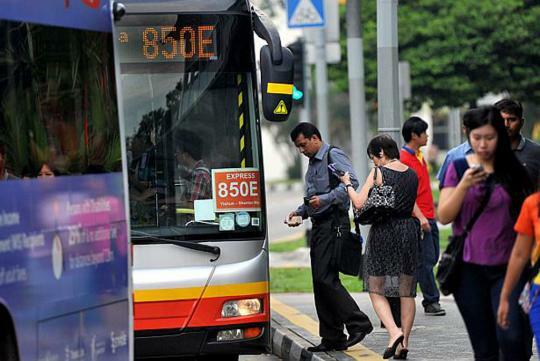 In Singapore, it is still unclear how bus fares will be adjusted. Transport operators should no longer be the ones applying for a fare hike, since their earnings are not affected by fares. Their income will be from the contract sum, service standard bonuses and operating efficiency. It would be strange if they carry on the practice of applying for fare adjustments. But it would be doubly strange for the Government to apply to the Public Transport Council - which it appoints - for fare revisions. Whichever way, it is clear that subsidies will be central to the contracting regime. From a public policy perspective, using tax dollars to defray the cost of public transport - a common practice worldwide - is sound. It makes sense in the big picture too, especially to a small country like Singapore, which cannot accommodate widespread car ownership. But how big a bang it gets for the buck - especially in terms of improved service - depends much on how well the new model is implemented.